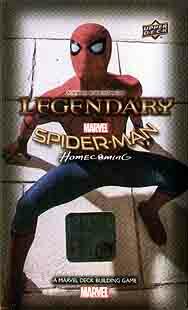 This groundbreaking expansion introduces the Marvel Cinematic Universe to the world of Legendary. For the first time ever, images and characters as seen on screen can battle side by side with comic book characters. Look for amazing images from the acclaimed feature film as well as spectacular new Keywords and Mechanics in this unique addition to the Legendary family that is sure to wallcrawl to the top of your shopping list.